10th birthday wishes should be exciting and inspiring because turning 10, leaving single numbers and hitting double digits for the first time is a major milestone that should be well celebrated. If you are trying to figure out the best birthday wishes to write in a 10th birthday card, you have found the right resource. We have a collection of cool, creative, fascinating and heart-warming examples of 10th birthday wishes that’ll make this milestone a special day for your kid. Ten is the number which completes a count, and so in you tenth birthday I wish you get countless happiness to cherish in life. Wish you a happy birthday with full of fun and frolic and a party with your friends. Burst the balloons and blow the whistle and make the best birthday. From a bud you have become a bloomed flower now and on this tenth birthday I wish you get all the color and fragrance of life. With the every growing step of yours we have wish safety and care for you but from today on you seventh birthday we would wish intelligence and happiness for you. Enjoy your birthday that comes once in a year, may this 10th birthday brings loads of showers from angels to bless you with charm and fun. You have grown to another year, so as your clothes, thoughts and actions. Today you are the best party face on the entire globe with shining charm. Congrats..!! dear. You have crossed into another year with a double digit score. No more single digits in your life to celebrate with. Happy birthday. Wohooo! You have completed 10 years of your life. I wish that you live your life ahead with great happiness. Happy birthday! You have bagged another year , it’s the time for you to put on 2 digit candles on your beauty cake. Happy 10th birthday greetings to you. Wish 10 wishes on this 10th birthday. May all your wishes come true within a short span. Happy birthday my 10 year old teen..!! It’s the time for you to act more like a teenager, gone are those calls where you will be called as a young lad. Cheers…!! Welcome to the teenage. Hello lovely..!! You have stepped into your 1st decade of your life. Have a great birthday party with loads of pomp and prays. God bless my teen. My coolest kid on the earth has got 10 years now. 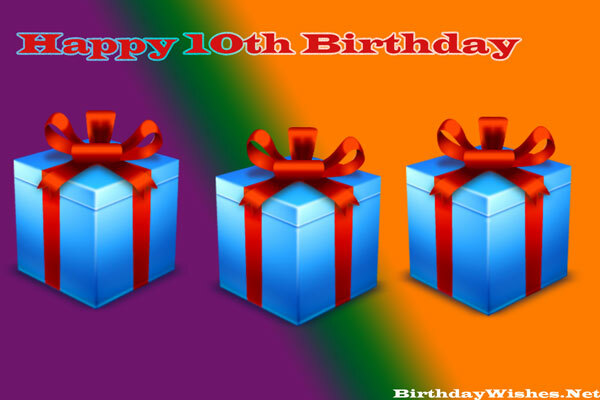 I brought you cool 10th birthday wishes for you with lovable songs and sweet candies. It’s no more 9. It’s your 10th birthday. A new teenage world starts for you from now on with a hope of imagination and ray of dreams. May all your dreams comes true on this 1st decade of your life. 9 have retired now, and 11 have appeared too early. It’s time for you to enjoy your 10th birthday. We welcome you to the new chapter of your life. This 10th birthday is a complete white page where you need to fill your dreams with your own words. More challenges ahead for you on this new double digit year of your life. May god pour all his love on you all your life. This phase of your life is a new chapter. Sometimes you will be the leader, sometimes you will be the learner. May the god lead your life with path full of flowers. Birthdays comes and vanish in just one day. But this birthday is so special for you as you have entered in teenage. This birthday will teach you something new. I just sealed all my love and wishes for you. It’s the time for you to raise a pomp toast on your 10th birthday.